750 km or more from Perth. This page will show you the 4 Wheel off road locations we have visited which are located at a distance of 750 km or more from Perth. 750 km or more from Perth in Western Australia will take you to the Goldfields in the Western part of Western Australia or Kalbarri if you follow the WA coast to the North. 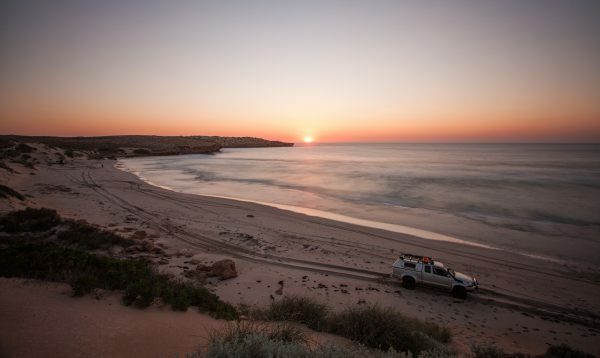 If you travel South the 4 Wheel drive locations will be places like Denmark or Esperance. These places are more like a 4WD holiday as you will need at least 4 days and preferably 7 - 10 days because you will need at least 1-2 days travel just to get to your 4 Wheel off road locations. A lot of these places are very remote with no phone coverage and it is advisable that your 4x4 is well equipped and that you are self-sufficient as there are no facilities or drinking water available at most of these places. It would be a good idea to travel with another 4wd should you get into trouble or your 4wd breaks down. Make sure to bring extra fuel, 10 L of water for each person per day, rated recovery gear, spare parts including vehicle fluids, tools, an emergency GPS locator, a well equipped first aid kit and plenty of food. Always bring more than you estimate you will use in case of a breakdown or in case you get stuck in a remote area for any other reason. Esperance 4 Wheel Off Road Tracks. Beaches and rocky coastlines are the main attractions here and the many National Parks in the area. 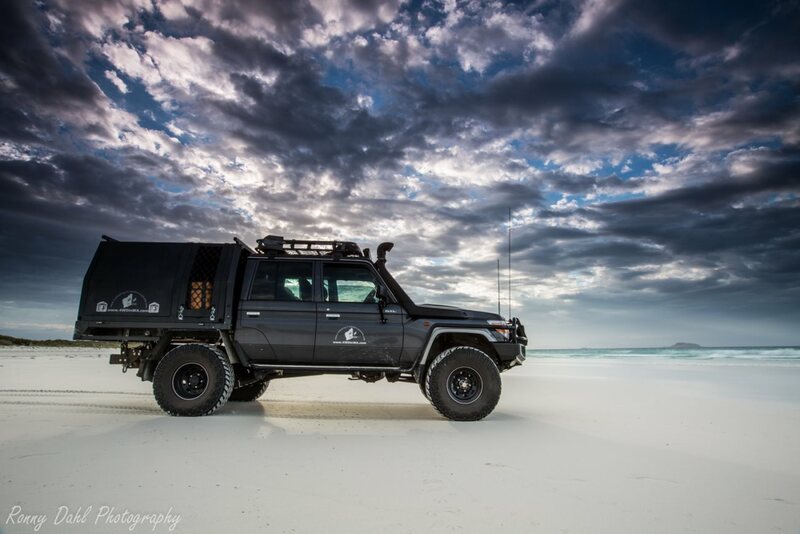 The Land Cruiser at Esperance, Western Australia. For general information about Esperance see this Link. Lucky Bay, this beach is voted the whitest beach in Australia and you will even find a campsite here. For more see Lucky Bay. Our favourite destination so far in the Esperance area have to be Orleans Bay, Hammer Head. A good 4WD challenge and your revard is some awesome beaches. For more Info see Orleans Bay, Hammer Head. Rossiter Bay To Dunn Rocks is another great beach track starting just 6 km East of Lucky Bay. For more information see Rossiter Bay To Dunn Rocks. 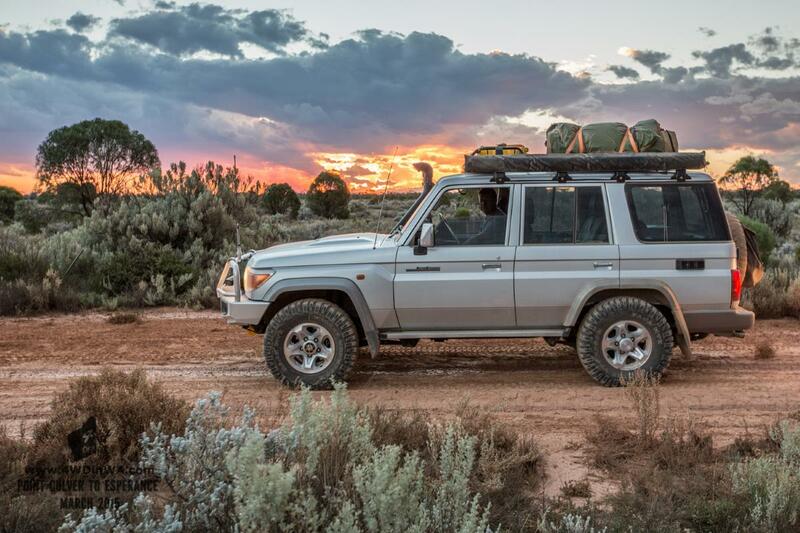 Toyota Land Cruiser In The West Australian Sunset. For more information see Israelite Bay Adventure. Size: Simply Huge, tracks from False Entrance to Steep Point are about 40km. Time to allow: 4 days minimum, to see and do everything without rushing 7-10 days is recommended for your 4x4 adventure. Sunset, False Entrance Bay, Western Australia. Steep Point is the westernmost point of Australia and that alone makes it worth travelling to. The sense of achievement getting to the westernmost point is rewarding in itself and the views on the way are spectacular. For more information go to Steep Point 4x4 adventure. Explore the massive Blow Holes along the Zuytdorp Cliffs at Steep Point. For more information see: Zuytdorp Cliffs and blow holes. Leave 4 Wheel Off Road And Go To 4 wheeling In Western Australia.